Cronica Necunoasterii: DISARM DSEI ! 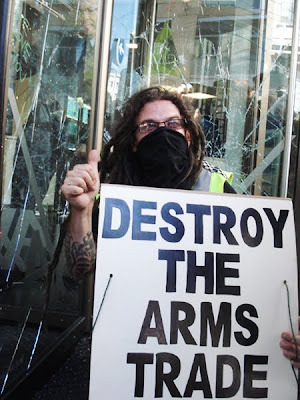 Windows were smashed and paint bombs thrown as hundreds of anti arms protesters descended on The City to voice their anger against the investors in the arms trade. 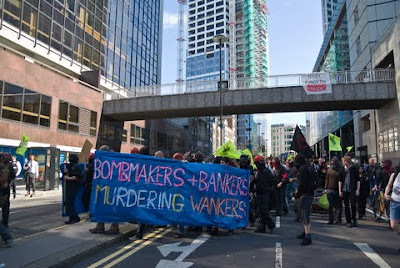 The protest, designed to coincide with the opening of DSEi – Defence Systems Equipment International – the world’s largest arms fair – focussed on targeting some of the biggest backers of the arms trade, including Barclays, Legal and General and Axa. British Telecom, who have a £59 million share in the arms trade were also occupied. Publicat de zarathustra la 12:22 a.m.